Cloud / Hybrid / Disk / Flash / Tape / Data Centre - Complete Data Management. A leader in this field, our experienced team are able to help you understand and deliver proven solutions for your clients - from Desktop to SMB to Enterprise. Ensure enterprise-grade high availability and security for your clients data and systems. Our comprehensive range from award-winning vendors keeps organisations - from SMBs to Enterprise - up and running 24/7. Your Paper-to-Digital Transformation journey starts here. A4/A3 document scanners, large format scanning, data & document capture, document conversion, information management - scan, digitise and manage just about any type and size document. A range of business productivity improvement solutions to help you with organisation-critical tasks.Data Analytics & Business Intelligence, Disc Publishing, Digital Transformation, Encryption & Security. 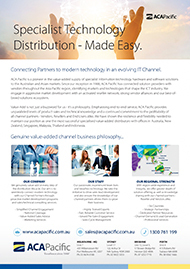 Discover the ACA Pacific Advantage..
Genuine value-added channel business philosophy. ACA Pacific is a pioneer in the value-added supply of specialist information technology hardware and software solutions to the Australian and Asian markets. Since our inception in 1988, ACA Pacific has connected solution providers with vendors throughout the Asia Pacific region, identifying markets and technologies that shape the ICT industry.